These religious celebrations are lively, high-spirited affairs during which people share meals of red rice, spicy pork, EmaDatsi, and Momos (pork dumplings) whilst drinking the heady traditional rice wine known as Ara. These occasions provide the villagers a respite from the hard labour of their day-to-day lives and gives the community an opportunity to catch up with family and friends. One of the most distinctive features of the Bhutanese is the traditional dress, unique garments that have evolved over thousands of years. Men wear the Gho, a knee-length robe somewhat resembling a kimono that is tied at the waist by a traditional belt known as Kera. The pouchformed at the front of the Gho was traditionally used for carrying food bowls and a small dagger. Today it is accustomed for carrying small articles such as wallets, mobile phones, and Doma (beetle nut).Women wear the Kira, a long, ankle-length dress accompanied by a light outer jacket known as a Tego with an inner layer known as a Wonju. 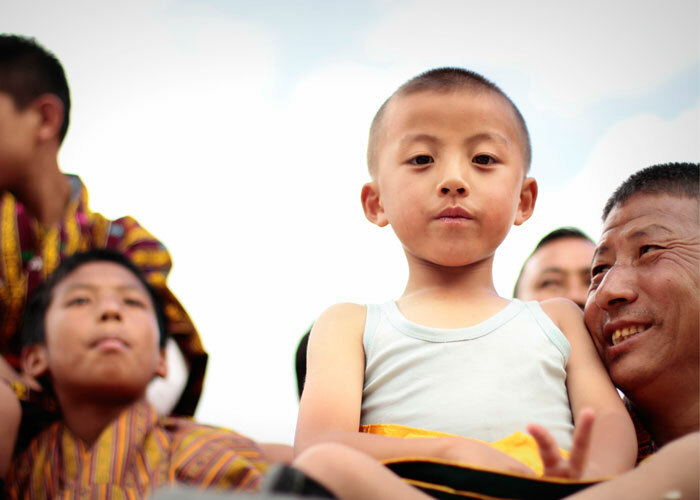 Tribal and semi-nomadic people like the Bramis and Brokpas of eastern Bhutan generally wear clothing that differs from the rest of the Bhutanese population. The Brokpas and the Bramis both wear dresses woven either out of Yak or Sheep hair. Bhutanese still wear long scarves when visiting Dzongs and other administrative centres. The scarves worn vary in colour, signifying the wearer’s status or rank. The scarf worn by men is known as Kabney while those worn by women are known as Rachu. The Rachu is hung over the left shoulder of a woman. Unlike the scarves worn by men, Rachus traditionally did not have any specific rank associated with its colour. However, with women joining the ranks with men now, some Rachushave been retrofitted to indicate these ranks. Rachus are usually woven out of raw silk and embroidered with beautiful rich patterns. Until just a few decades ago, arranged marriages were common and many married among their relatives. 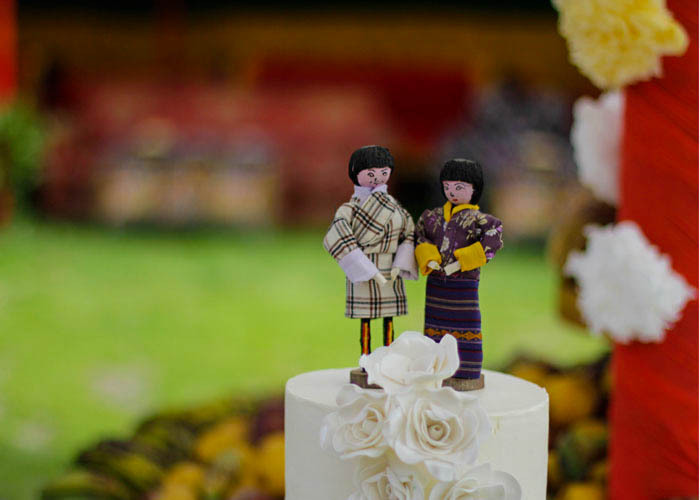 In eastern Bhutan, cross-cousin marriages were also once common. However, this practice is now becoming less common amongst the literate masses and most marriages are based on the choice of the individuals. Marriages are simple affairs and are usually kept low-key. However, elaborate rituals are performed for lasting unions between the bride and the bridegroom. As the religious ceremony comes to an end, parents, relatives, and friends of the couple present the newlyweds with traditional offerings of scarves along with gifts in the form of cash and goods. In Western Bhutan, it was commonfor husbands to live in his wife’s house after marriage – this still happens in rural areas. While in Southern and Eastern Bhutan, the wife generally moves into her husband’s home. Of course, the newlyweds may also choose to live on their own. Divorce is also an accepted norm and carries no ignominy or disgrace within the country. The child is not immediately named; this responsibility is usually entrusted to the head lama (Buddhist priest) of the local temple. 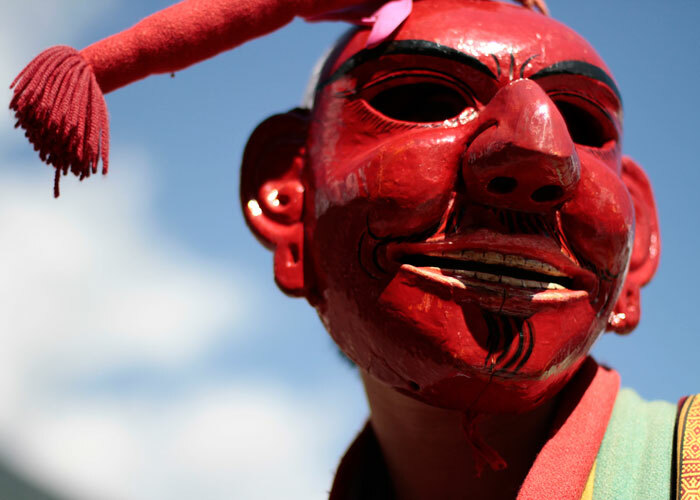 The mother and child will also receive blessings from the local deity (natal deity) and following tradition; the name associated with the deity is given to the child. In some cases, the child is given the name of the day on which the child is born. Based on the Bhutanese calendar, a birth horoscope is written which will detail the various rituals to be performed at different times in the life of the child and to an extent predict his or her future. The 7th, 14th, 21st,and 49thdays after a person’s death are considered especially important and are recognized by erecting prayer flags in the name of the deceased and performing specific religious rituals. While the deceased are normally cremated, funerary practices vary amongst the ethnic groups. 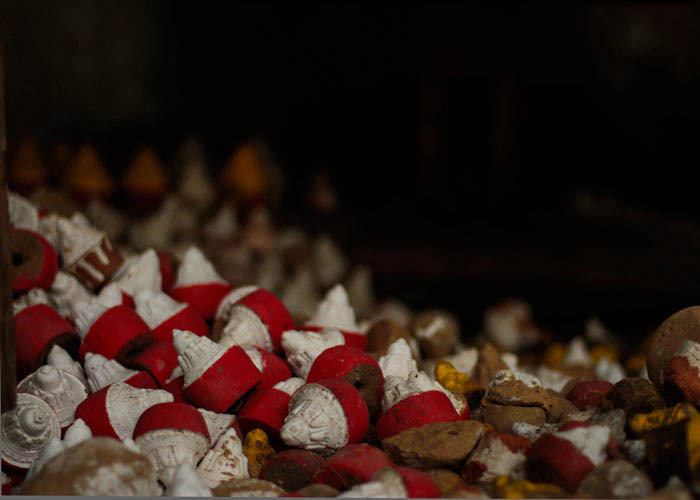 The Lhosthampas, who are mostly Hindu, cremate their dead following Hindu rituals. The Doya indigenous people in the South typically bury their dead next to the house within a stone mound along with their belongings. The body is put upright in a sitting posture facing the direction of the rising sun. The Brokpasin the North carry out ‘Sky Burials,’ a process in which the deceased are prepared and left atop mountains to be devoured by vultures as a final act of compassion and generosity. Elaborate and ancient rituals are also conducted on the anniversary of the death with the erection of prayer flags. The relatives and people of the locality come with alcohol, rice or other sundry items to attend such rituals. Traditional Bhutanese eating habits are simple and, in general, food is eaten with hands. Family members eat while sitting cross-legged on the wooden floor with food being served first to the head of the household. Traditionally dishes were cooked in earthenware, but with the easy availability of modern goods, pots, pans, and rice cookers have largely replaced their use. 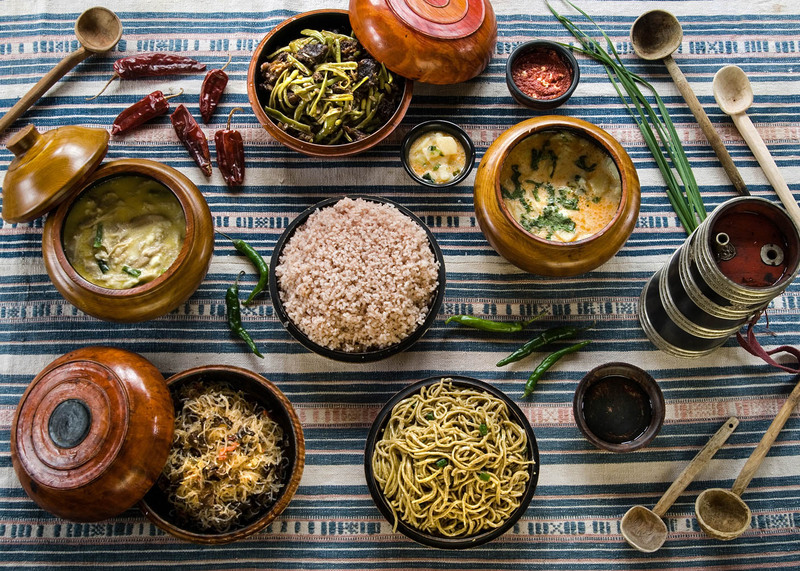 A typical Bhutanese meal consists of red rice, a dish of Ema Datsi – the country’s favourite dish of chili and cheese, pork, beef curry, and lentils.